Each year, prior to the second and third term school holidays, more than 60 'Family Fishing Lakes' are stocked with ready-to catch advanced yearling (approximately 180g) rainbow trout. The lakes are in or nearby population centres throughout Melbourne and provincial Victoria and offer access for anglers of all ages and abilities. They also provide angling opportunities for kids during the school holidays. They are a great place for young people and their families to fish, some perhaps for the first time. The following is a helpful guide with tips for beginner anglers who want to fish these lakes. It covers what fish may be present, some useful rigs and baits, and information on skills like casting and knots tying. Rainbow trout are native to the western coastal rivers of North America from Mexico to Alaska. Introduced to Australia in 1894, they are found in lakes, streams and rivers of the cooler temperate regions. The upper body colour varies from olive-green to steely-blue, the sides are lighter and the belly usually silvery-white. The head and body are heavily marked with small black spots, which are most numerous on the upper body. Top and tail fins are also heavily spotted. There is often a pink, red or orange flash along the head and sides of the body. At other times rainbow trout lose these vivid markings and develop an overall silvery appearance, especially if the water they are caught from is discoloured. Rainbow trout are known to attain 1.2 metres in length and 18 kg in their native North American habitat (western coast). In Australia, fish larger than 60cm and 5 kg are uncommon. Rainbow trout are carnivorous, with young fish eating mainly aquatic and terrestrial invertebrates with worms, molluscs and crustaceans also being taken. Adults feed on small forage fish. A popular and highly regarded sport fishing species. A commonly caught fish renowned for its table qualities. A smaller species of fish which requires fine hooks and light tackle. Often caught when the water is discoloured after periods of rain. A declared noxious species which must not be returned to the water if caught. Regulations such as bag/possession and size limits apply to some species of fish caught in Family Fishing Lakes. For up-to-date information on these regulations call 136186 or read more about recreational fishing. This rig has many uses in both freshwater and marine fishing. It can be used to catch trout, redfin, carp, golden perch and Murray cod in freshwater, and snapper, whiting, flathead and bream in saltwater. The rig consists of a sinker threaded onto the main line above a swivel. Another line, called a trace, then leads down to a hook. One type of knot, such as a locked half blood knot (see page 9) or clinch knot (see page 10), can be used to tie the entire rig. The most commonly used sinker is a ball sinker. As a general rule the sinker should be kept as small as possible, as long as it enables the angler to make a suitable cast. The swivel should also be kept small. The trace is usually about 40 to 50 centimetres long. The size of the hook is governed by the type and size of bait that will be used, as well as the type of fish that the angler expects to catch. Popular natural baits for rainbow trout include earthworms, scrubworms and maggots which can either be fished on the bottom of the lake or under a float. One of the best natural baits are mudeyes (dragonfly larvae), which are hooked through the wings with a small fine hook and fished under a bubble float. Corn kernels can be used to catch rainbow trout as can the various artificial baits available in fishing tackle stores. Tip: Use small chemically-sharpened hooks in sizes 6 – 10. This rig is used very successfully by anglers who are fishing for trout in freshwater lakes and rivers. The bubble float is allowed to run freely on the main line, just like the sinker in a running sinker rig. This means the fish can take the bait without having to feel the resistance of the float being pulled under the water. To assist with casting the float is partially filled with water. When fishing in a lake or reservoir, keep the wind at your back to prevent the bubble float drifting back towards the shore. A very small swivel can be tied to the line below the bubble float. A small piece of cork is added to suspend the bait at a desired depth and stop it sinking towards the bottom. Make a small slit in the piece of cork, then wrap the line around and pull it, so that the line sits tightly in the slit. Expert bubble float anglers grease the line on their fishing reel with a product available in tackle stores so the line floats on the surface of the water, from the rod to the float. Once you have mastered fishing for rainbow trout with bait you may progress to fishing for them with lures or flies. Lures such as bladed spinners, bibbed diving lures and soft plastics are effective. Wet flies imitate aquatic insects and can be fished under a float but need to be retrieved very slowly. Fly fishing is perhaps the most exciting way to fish for trout and a special rod and type of line is required. When fly fishing, you can use a wide range of artificial wet and dry flies to imitate the huge variety of aquatic and terrestrial insects eaten by trout and other species. 2. Hold the rod in your casting hand with two fingers either side of the reel foot. 3. Bring the line roller around into a position directly under the rod. 4. Hold the line against the rod with your index finger, slightly down from the spool. 5. Keep holding the line and open the bail arm with your free hand. 6. Look behind you to make sure that the area is clear and bring the rod back to a 2 o'clock position. Make sure the line isn't tangled around the rod tip. 7. Looking forward at the area that you wish to cast to, bring the rod forward in a smooth movement, releasing the line from your index finger at a 10 o'clock position. 8. Close the bail arm by turning the handle of the reel, and winding up the slack line. When casting give yourself plenty of space from anyone around you. Always check behind you when back-casting to prevent snagging people, trees or jetty railings. The overall success of any fishing experience will eventually be determined by the strength of a knot. A securely tied knot is often the difference between catching a hooked fish or losing it. Although there are many different types of knots, the following two are adequate for most basic types of fishing and can be used to tie fishing line to hooks, swivels and lures. Practise these knots until you can tie them without referring to the instructions! 1. Pass the line through the eye of the hook and wind the tag end of the line around the main line four or five times, or more. 2. Pass the tag end through the loop that has formed at the hook. 3. Bring the tag end up and pass it through the large loop that has been formed. 4. Tighten the knot by pulling slowly and firmly on the main line. 1. Pass the line through the eye of the hook twice so that a loop is formed. 2. Holding the loop in one hand, wrap the tag end of the line around the main line four or five times. 3. Pass the end of the tag through the double loop that has formed at the hook. 4. Tighten the knot by pulling on both the main line and the tag at the same time. A suitable fishing outfit for Family Fishing Lakes would consist of a light to medium spinning rod (2-4 kg rating) with a matching spinning reel. Monofilament fishing line of around 3 kg breaking strain would be ideal, and a small tackle box needs to be filled with a selection of small sinkers, hooks and swivels (and lures if desired). Another essential piece of equipment is a landing net, as rainbow trout are very difficult to grasp by hand. Whenever you go fishing, your personal safety should be your main consideration. The following tips should help make sure that each of your fishing trips is a safe one. Always fish with a partner, preferably an adult. Always let someone at home know where you are going fishing and approximately what time you will be back. Learn to swim. Fishing involves being on or near the water so it makes very good sense to be able to swim. Take care with sharp knives and hooks. Avoid steep and unstable banks. Be careful and sensible at all times. No fish is worth putting your wellbeing in danger. Minimum and/or maximum size limits apply to many species of fish caught by recreational anglers in Victorian waters (refer to the current edition of the Victorian Recreational Fishing Guide). The size of fish must be checked at the first available opportunity. Undersize fish must be released immediately. Measure fish from tip of snout with mouth closed, to tip of tail. You are obliged to immediately return to the water any fish you do not intend to keep. Unwanted fish must be returned to the water with the least possible injury or damage. This does not apply to fish declared to be noxious, such as European carp. The fish's body has a slimy protective coating, which can be damaged by excessive handling or equipment. Incorrect handling damages fish and reduces their chance of survival after release. A fish out of water cannot live for more than three or four minutes because of brain damage caused by lack of oxygen. An exhausted fish played too long may not recover. If a fish is to be released, the hook should be removed while the fish is still in the water. You will need to judge whether to remove the hook or not, depending on the potential damage that may be caused to the fish. If the fish is hooked in the jaw or mouth, remove the hook as cleanly as possible using a hook remover or long-nosed pliers. If the fish is hooked deeper in the mouth or in the stomach through having swallowed the bait, do not try to pull or twist the hook out. Leave the hook where it is and cut the line as close as possible to the hook. prior to release, hold the fish gently and move it forward to force water through its gills until it has revived and is able to swim normally. 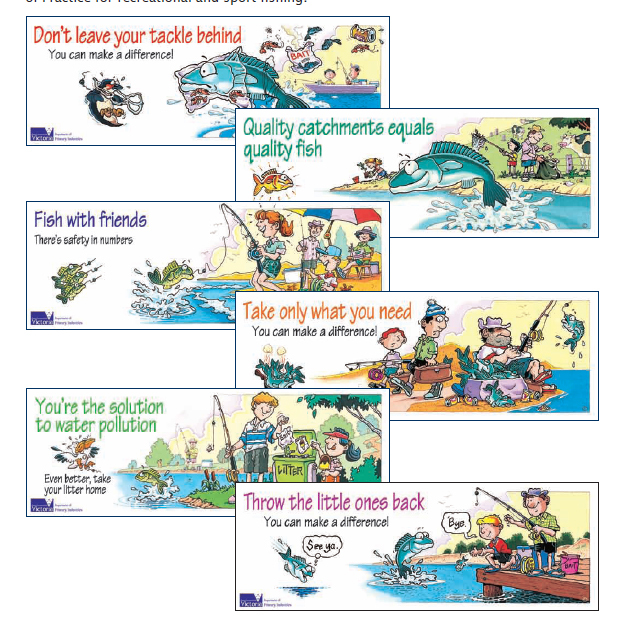 You can help manage, protect and conserve fish and their habitat by following the six principles of the Junior Code of Conduct (below), which was developed from the National Code of Practice for recreational and sport fishing. The following products and information will help you get started. A full colour booklet that describes the catch limits for species you are likely to encounter in Victorian waters. It includes pictures of various species, along with minimum legal lengths, bag limits and closed season information. Download a copy of the Victorian Recreational Fishing Guide or pick one up free of charge from most fishing tackle shops or contact the Customer Service Centre on 136 186. This is a water resistant, condensed version of the Victorian Recreational Fishing Guide and includes catch limit information for common species. Pocket cards are handy pocket-size information cards that can be stored in your tackle box. They are free of charge and are available at some fishing tackle stores that sell recreational fishing licences. They can also be obtained from regional DPI offices or by ringing the Customer Service Centre on 136 186. The Know Your Limits Pocket Cards are also available in Cambodian, Vietnamese and Chinese. Apply this stick-on ruler to your boat so you can measure fish easily and return undersize ones to the water quickly. Rulers are free of charge and are available at some fishing tackle stores that sell recreational fishing licences. They can also be obtained from regional DPI offices or by ringing the Customer Service Centre on 136 186. A Recreational Fishing Licence (RFL) covers all forms of recreational fishing in Victorian waters. Unless you are exempt, a RFL is required when taking, or attempting to take any species of fish from public waters. For exemptions refer to the Victorian Recreational Fishing Guide. You can buy a Recreational Fishing Licence online or from most fishing tackle shops. Money from the sale of RFLs funds projects that improve recreational fishing opportunities. You can help the Department of Primary Industries ensure there are 'Fish for the Future' by calling 13FISH (133 474) anytime to report suspected illegal fishing activity. All information received will be treated as confidential.